Travel into the heart and mind of an extraordinary autistic boy in this deeply imaginative debut novel of a mother’s devotion, a father’s punishment, and the power of love. Sephiri is an autistic boy who lives in a world of his own making, where he dwells among imagined sea creatures that help him process information in the “real world” in which he is forced to live. But lately he has been having dreams of a mysterious place, and he starts creating fantastical sketches of this strange, inner world. Brenda, Sephiri’s mother, struggles with raising her challenged child alone. Her only wish is to connect with him—a smile on his face would be a triumph. Meanwhile, Sephiri’s father, Horus, is sentenced to life in prison, making life even lonelier for Brenda and Sephiri. Yet prison is still not enough to separate father and son. In the seventh year of his imprisonment and the height of his isolation, Horus develops supernatural mental abilities that allow him to reach his son. Memory and yearning carry him outside his body, and through the realities of their ordeals and dreamscape, Horus and Sephiri find each other—and find hope in ways never imagined. 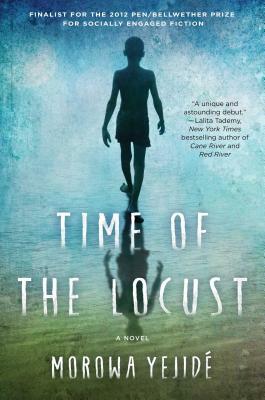 Deftly portrayed by the remarkable and talented up-and-comer Morowa Yejidé, Time of the Locust is a brilliant narrative about the psychological realms of solitude, youth, and wonder. At its heart, this is a harrowing, surreal, and redemptive journey to the union of a family. Morowa Yejidé’s (pronounced: Moe-roe-wah Yay-gee-day) short stories have appeared in the Istanbul Review, Ascent Aspirations Magazine, Underground Voices, the Adirondack Review, and others. Her story "Tokyo Chocolate" was nominated in 2009 for the Pushcart Prize, anthologized in the best of the Willesden Herald Stories, and reviewed in the Japan Times. Her novel Time of the Locust was a 2012 finalist for the national PEN/Bellwether Prize and longlisted for the 2015 PEN/Bingham award. Time of the Locust is also a 2015 NAACP Image Award Nominee for Outstanding Literary Work. She lives in Washington, DC, with her husband and three sons. "A stunning, magical novel about the power of love between an imprisoned father and an autistic son. Original, compelling, Yejidé explores the human psyche in a dreamscape world." "Time of the Locust is a brave and mesmerizing journey into the mysteries of autism, solitary confinement, and inner struggle told with dazzling imagery and passion. In this luminous first novel, the crossroads between the dream world and the physical world is a place where physical chains—the child's autistic mind, the maximum security facility where the father is incarcerated—are of no consequence. It is a place where love is born, and is allowed to grow and thrive. A soaring odyssey of the human spirit." "Time of the Locust is a fearless rendering of a family’s struggle to cope with single motherhood, fatherlessness, and a child’s autism. The physical, psychological, and philosophical prisons in which the characters find themselves transport us to places we’ve never even imagined—and higher spiritual planes are found in the lowest of realms. Reminiscent of Keri Hulme’s magnificent novel The Bone People, Morowa Yejidé's novel explores a world of chaos and the infinite promise of the mind." "Yejidé is? poised to make her mark with a novel that might be described as one of family connection—but encompasses so much more... When that father, Horus, develops supernatural abilities and connects with his son, strange and powerful things happen, but the focus is less on fantasy than on the fantastic power of love to bind and protect us.?" ? "Time of the Locust is jaw-dropping awesome. A superb debut work of magic realism and finalist for the Pen/Bellwether Prize for socially engaged fiction, this is the book for you, your friends and your book club. From the world of the autistic prepubescent son, to the mother who raises him and the father that sired him, and the situation that connects and separates them all, this story will cause you to look at the world around you differently whenever you look up from it. Read it!" "There are characters who hook you from the second you meet them on the page. Sephiri, the autistic boy at the heart of Time of the Locust is one of them." ? "At times almost mystical in its intensity, Yejidé’s prose brings lyricism to her dark subject matter and unhappy characters, eventually introducing a kind of magical restoration to her shattered fictional family.?" "Beautiful prose conveys the sadness and fractured selves of these characters, who are both strong and fragile. The depth of pain can make for difficult reading, but the rendering of Sephiri’s interior life, in particular, is arresting, and the novel is challenging and memorable.?"